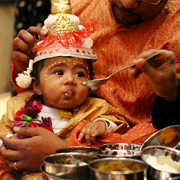 As Hindus are known to observe strict religious norms and practices, naming ceremonies are organised in a grand manner across all states and the region. While adopting one of the countless names of Hindu Gods and Goddesses are quite common in Indian families, the newborns are decked up with fine, silken cloth and a gold chain around its neck to signify the ushering in of prosperity to the family with the arrival of a new member. The traditional naming ceremony is called Namakaran and is an auspicious occasion for the family. This is generally held on the 12th day of the birth, but in some cases on the 101st day of the child birth or on his (or her) first birthday. The rituals are held either at home or in a temple where the priest invokes the blessings of Hindu Gods, Goddesses, Agni and the five elements that created life as per Hindu belief. The spirits of forefathers are called upon to bless the child which is placed on the father’s lap. The father whispers the chosen name in his child’s right ear by using a betel leaf. On this occasion, the horoscope is prepared and placed in front of the deity to bless the child with long and prosperous life. While the child won’t be able to understand the significance of this naming ritual, the parents take up on themselves the responsibility of grooming their child into a worthy and honest individual having a respectable career in this life. As surnames are common in Hindu families across the country, one can easily identify the birthplace of a person by hearing his or her name. The ancient culture and Sanskrit literature, if the family is in the North, or Dravidian languages, if the child is born to a South Indian family, have a much say in the naming of a child. Usually, the couple would have prayed to their favourite deity for early birth of their child and hence, the latter is given the name of that deity (or its variations) as a form of thanksgiving to that God (or Goddess).